Our final post of the 1st annual Google Sightseeing ‘Volcano Day’ is the simply incredible San Francisco volcanic field in northern Arizona. The field covers 4700 square kilometres and contains 600 volcanoes less than 6 million years old, including the SP Crater, which is shown in our thumbnail. Check out the lava flow! It extends 4 miles northwards from the cone and is around 100 feet thick (make sure you zoom in, it’s in hi-res 😀 ). Unfortunately the Sunset Crater is in low-resolution. It’s the area’s youngest volcano, having erupted lesss than 1,000 years ago, and it’s been a National Monument since 1930. There’s a great page about the whole area on the U.S. Geological Survey site, and they also have a particularly good photo of the SP crater lava flow. Many thanks to Jeff Alu, Matt Van Pelt, Jeff Burton, Eric, John King, Scott Jones, Kevin Wampler and Stephanie and to anyone else who I missed throughout these volcano posts. Thanks everyone! 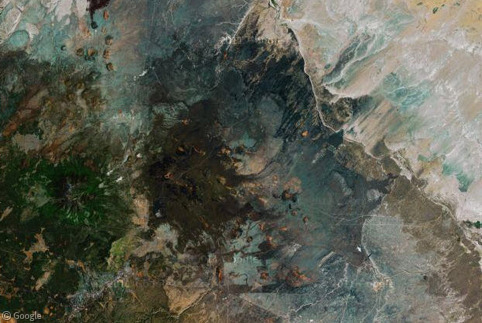 Is that massive, ink-blot looking thing around the SP crater forest? Oh, should have payed a bit more attention to the post. My bad. That is awesome. It looks really strange and like was mentioned above, a ink-blot. Very cool. I just returned from a trip to SP Crater. Walking on the ancient lava field was amazing.